It’s just odd questions people have asked that you can vote on. 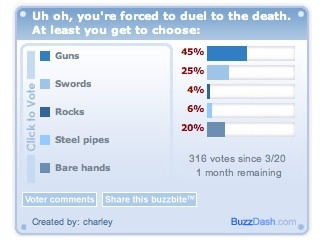 Everything from your weapon choice in a duel to choosing your favorite time period. The nice thing about this site is it taps into student interest in couple of ways. They can participate by voting. The questions are odd enough to be interesting. It’s social in that it allows you to see how others are voting. It’s dynamic. Questions have a limited life, so new stuff is always moving in. Just looking at charts, graphs and data for discussion would be useful. You could work in more math by having them keep track of the class response and compare it to the web response (ratios, percentages etc). I might also use the questions and data as writing prompts. 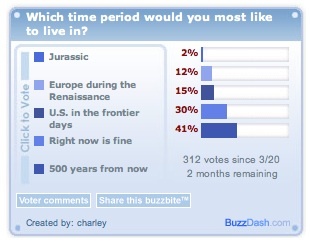 – Why did you choose the _______ period as your favorite period to live in? Why do you think so many others agreed/disagreed? It’d be a fun icebreaker for the first few days of school. A few odd educational goodies from today’s RSS soup. I lay them out here for your dining pleasure. Mental Floss serves up Monte Python clips referencing all sorts of classic literature. References include- Proust, Wordsworth, Shakespeare, Dickens and others. A great way to start of a class or provide a little levity when things are rough reading. They’re linked through on YouTube for your use but if that’s blocked don’t forget about Vixy.net to download them. 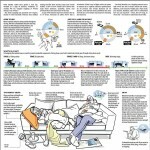 Boston.com’s “How to Nap” infographic would be a great way to re-think a project or report. Check out just how much information is crammed in there. You want some deep processing? Get your students creating something this dense in a way that’s visually pleasing and doesn’t feel oppressive. The Pi Crop Circle via the Uri’s Eso Garden Blog makes for some really interesting math related conversations and possible activities. Give them the image and tell them it is a code for pi and see who can figure it out. You could make one about pi or any other significant number or date. There would be lots of hands on measurement (angles, lines etc.) and thought involved (use chalk on the parking lot if you’re fresh out of local barley fields or maybe you’ve got a local field of tall grass).